W&W World Cardmaking Day Blog Hop! 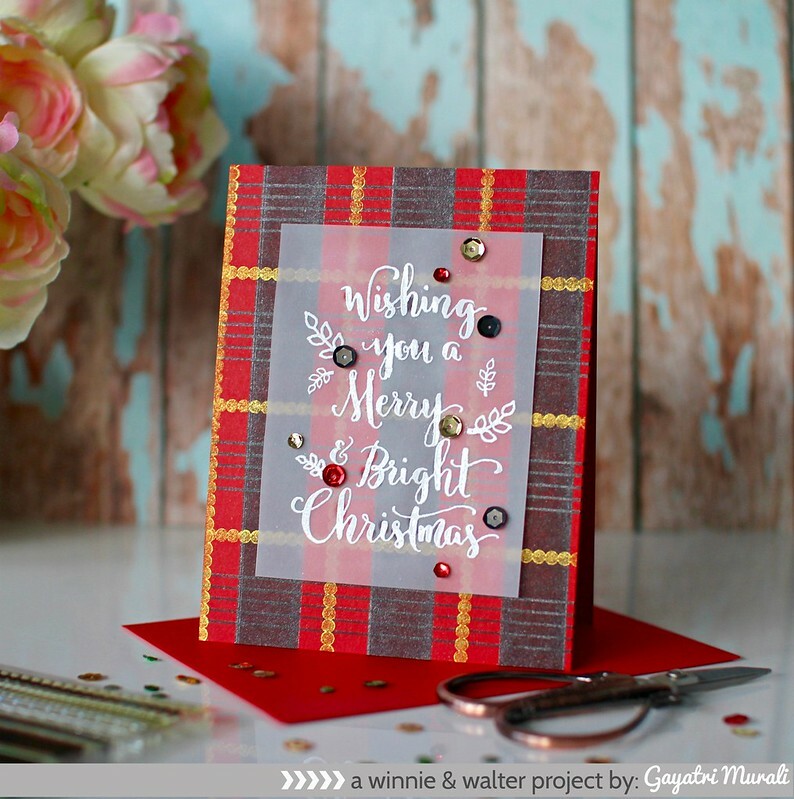 Welcome to Winnie & Walter’s World Card Making Day Blog Hop! You should have come from the gorgeous Rubeena Naz‘s blog. Don’t worry is this is your first stop. I will list all the designers participating in the blog hop towards the end of the post. For the blog hop today, I have a Christmas card. For the cards I stamped and created a plaid background using W&W’s Scenery: Stripes. Here is the card. I have used Delicata Black shimmer and Gold shimmer inks and MISTI to stamp my plaid background on red card panel. I left this panel to dry over night as they are pigment inks. Since the plaid background is gorgeous on its own, I wanted to keep my focal point as the sentiment. So I white heat embossed the sentiment from Merry & Bright with Evelin T Designs stamp set on vellum and adhered on the card front. I then adhered this panel on a red card base. I then added some gold, metallic red and onyx sequins from Pretty Pink Posh to complete my card. Stamping the plaid background is easy with MISTI and also get an even coverage of inks. Hope you like my card. Your next stop is to the talented Miriam Prantner‘s blog. And here is the list of all the designers participating in this blog hop. Come and hop along and get inspired. Comment along because there are prizes to be won! There are 3 random winners in total and they will be drawn from all the comments left on the different stops along the hop. Each winner will receive a $25 gift certificate to Winnie & Walter’s Shop. Thanks for stopping by today! Happy Hopping! Just gorgeous. Love the gold on the red plaid and the contrast of vellum on top. I love the deep red you used… very warm and cozy! Wow – black shimmer. Didn't even know that existed. What an effect it has on the colored CS. That is a gorgeous plaid, Gayatri! That's stunning! I love that plaid, perfect for the holidays. Beautiful holiday card! I love the traditional colors and the fun sentiment! On vellum! I love this card! Oh My Goodness! I have that stamp set and would never have thought to use it that way. I'm not a fan of plaid, but your card is just gorgeous! Happy WCMD! 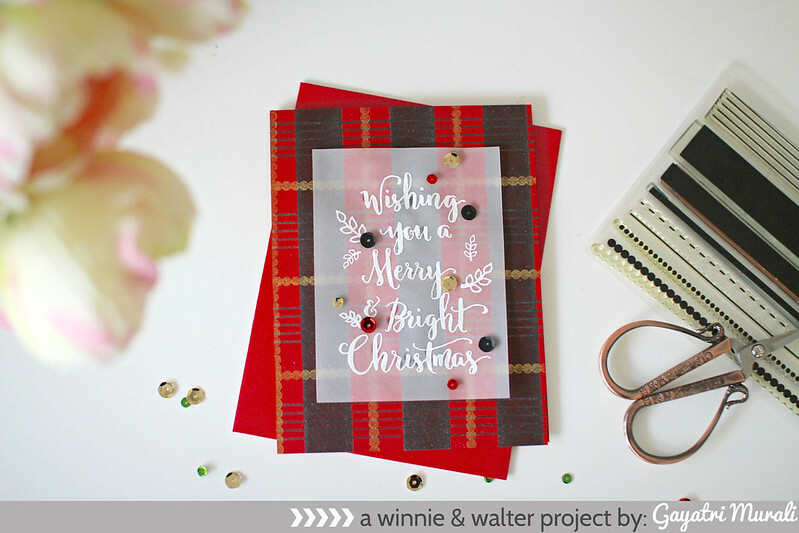 The plaid is absolutely stunning and makes for a card that is easy to mail as well. Gorgeous plaid card! I loooove the colors you chose, perfect for Christmas and a male card. Thanks for sharing and inspiring. The background looks so much like real ribbons–a lovely card! Stunning card!! That plaid is just beautiful!! And stamping the sentiment on the vellum is just perfect!! Dear heaven, that background is spectacular…amazing stamping. The vellum sentiment is perfect so as not to cover it up. Wow! That is an awesome plaid. Not just your everyday plaid – it's like a “dress up” plaid. Well done! The vellum really makes the sentiment pop while muting the bold and colorful background. Beautiful. Gorgeous background and love the use of vellum. Makes for a really elegant card. what a neat holiday card! happy wcmd to you! I do LOVE that plaid background you created. Your plaid background is awesome, Gayatri! I love the shimmery metallic inks on the colored cardstock! So pretty! Love your pretty unique card! Love this card and the way you created it! Nice textures and play with words on the velum! Beautiful Christmas card! The background in no way competes with the sentiment and I love the gold lettering! Love how the plaid background adds so much richness to your design. The vellum sentiment looks great against the rustic background! Love the textured rich backgrounds for holiday cards. So pretty! Simply beautiful! Love the matching sequins! ooh!! This is gorgeous! I love the plaid pattern with the gold trim – so amazing!! Perfect for a winter card! What a fabulous Christmas card! I love everything about it – the background stamping, the vellum overlay, the embossed sentiment. A delightful card! I have to remember this! Love how you did the plaid…gorgeous! Wow! Your plaid background is gorgeous! So lovely! Very pretty and elegant! The plaid background is fantastic four this type of card. What an amazing plaid background!! Love love love the look!! Wow! the plaid is gorgeous! so amazing I thought it was fabric! Stunning Gayatri. What an amazing card. that would cover part of the design. What a wonderful card! Beautifully done. Thanks for sharing it with us. It's a very gorgeous card ! I love your plaid background, it's so wonderful ! Thanks for sharing. I do INDEED like your beautiful card! The plaid background you made is just gorgeous!! And the white embossed sentiment on vellum over the red and black background has a stunning effect. TFS!!!!! WOWOWOWOWOWOW… mean, when I saw the picture I thought you had purchased the paper, but I am amazed! This is a technique I will have to try! Totally making me swoon! I love that background you created using W&W products! Jaw droppingly gorgeous! Lovely Christmas card. Thank you for the inspiration. Wow! What an amazing the card! The plaid is beautiful! What a wonderful plaid background for your Christmas card. This is a very classy card! I really like the deep reds. Oh, what a nice card! I love the effect of gold and the piece of vellum! Love, love, love your plaid design! Gorgeous red plaid background, beautiful card! What a lovely card! That plaid is stunning! Gorgeous card ! Vellum addition seems like a perfect idea. Very pretty card. Thanks for sharing. WOW – your plaid background is BOLD & BEAUTIFUL, LOVE IT and LOVE your DELICATE vellum sentiment panel too!!! Such a beautiful card!! Love the plaid background you have created!! Beautiful colors! Love the background and pretty sentiment! ’m late to the hop, but it’s a perfect day for doing so, as it’s gloomy and lightly snowing here. Nothing like awesome creativity to brighten my spirits, and your plaid delight has certainly done so! Gorgeous! wow, so beautiful…looks like upscale patterned paper!